Hey Guys! 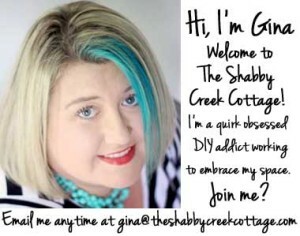 It’s Monica from East Coast Creative Blog– and I’m so excited to be hanging out at Shabby Creek Cottage today! 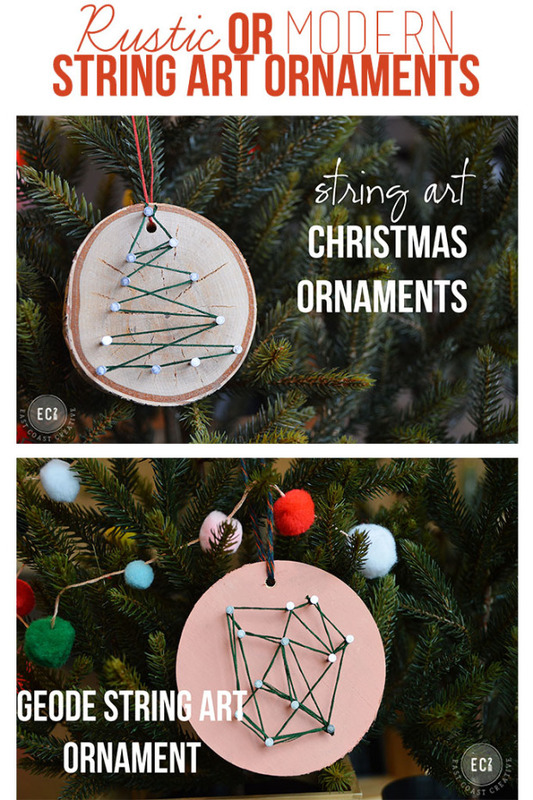 Jess and I have been loving all of Gina’s Christmas ideas lately, and today we’re here to share a fun DIY Christmas ornament idea that can go with just about any style! 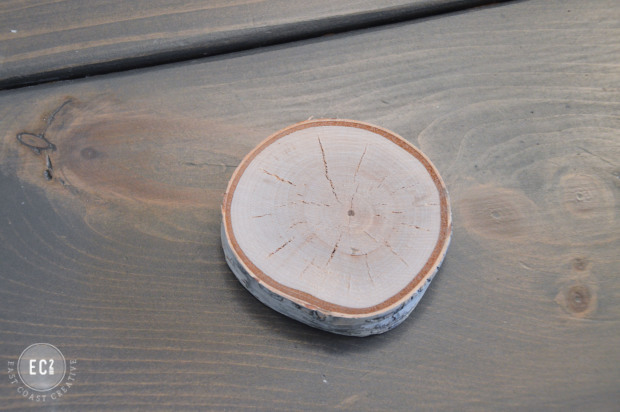 1- Choose a log (birch is the prettiest, but any will do) and slice it down to 1″ thickness using a chop saw or hand saw. 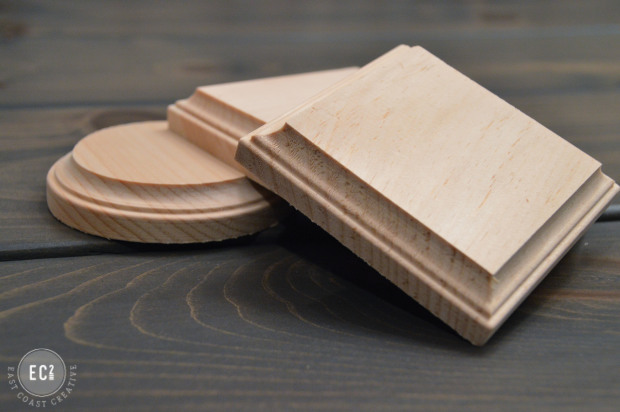 If you don’t live in the woods, you can also buy single birch logs at Michael’s- they’re the perfect size for crafting. 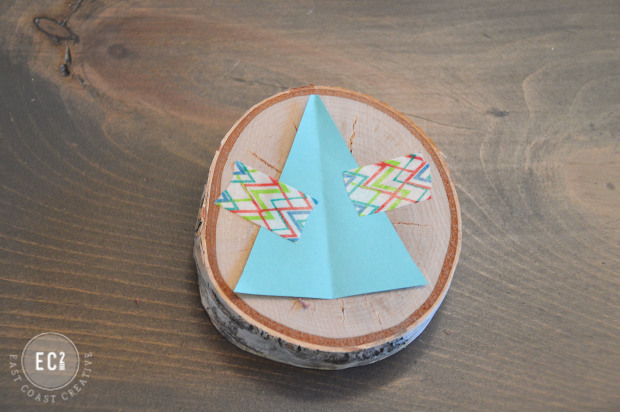 2- Cut a tree (or any shape really) template out of paper and use some tape to attach it to your wood disk. 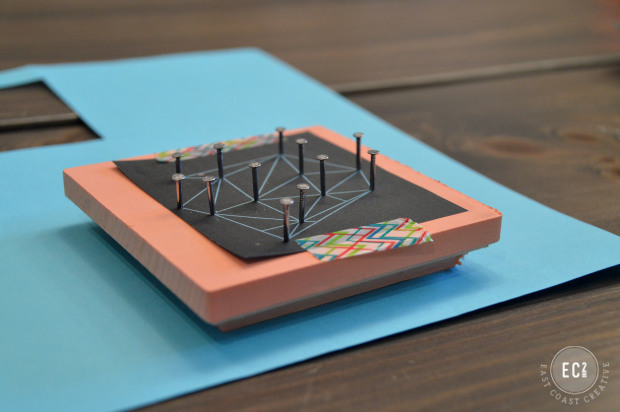 3- Nail your small finishing nails (mine we 1/2″) along the edges of your paper template. It’s okay to go right through the paper if you want, we’ll be peeling it away when we’re done anyhow. 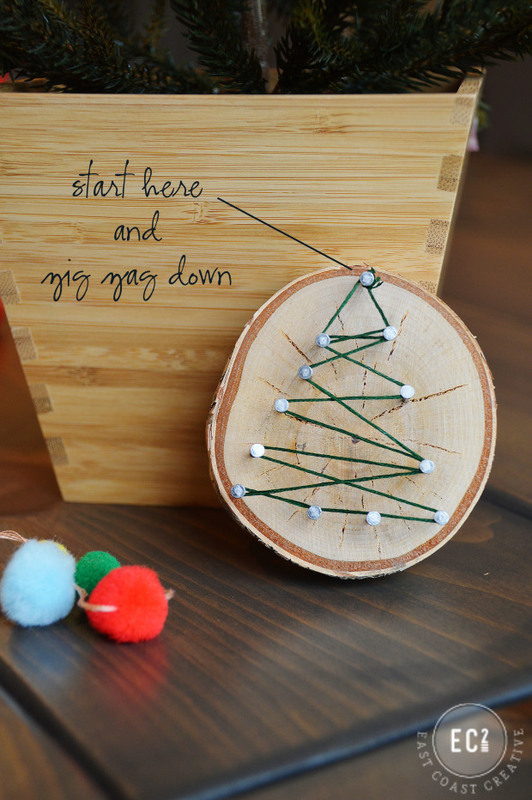 4- Tie a knot around the top nail and then zig-zag your string back and forth, creating your tree shape. Tie another knot when you’re done. 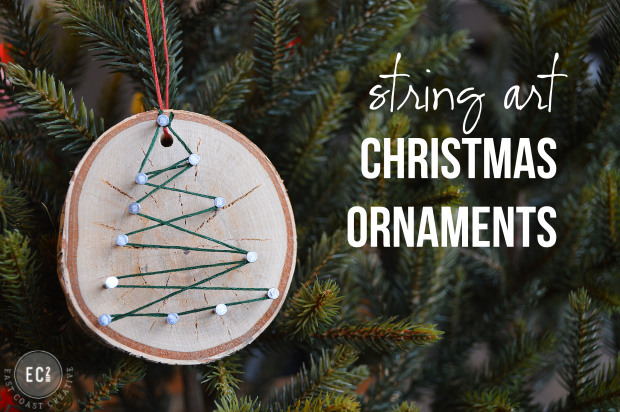 Trim off any extra string. 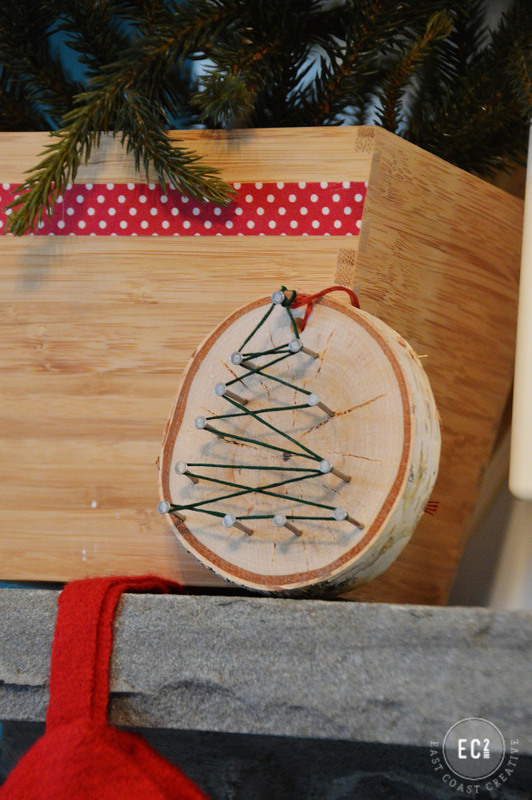 5- Use a drill bit to make a hole at the top, feed string through, tie a knot and Ta-Da- An adorable rustic, DIY Christmas ornament! 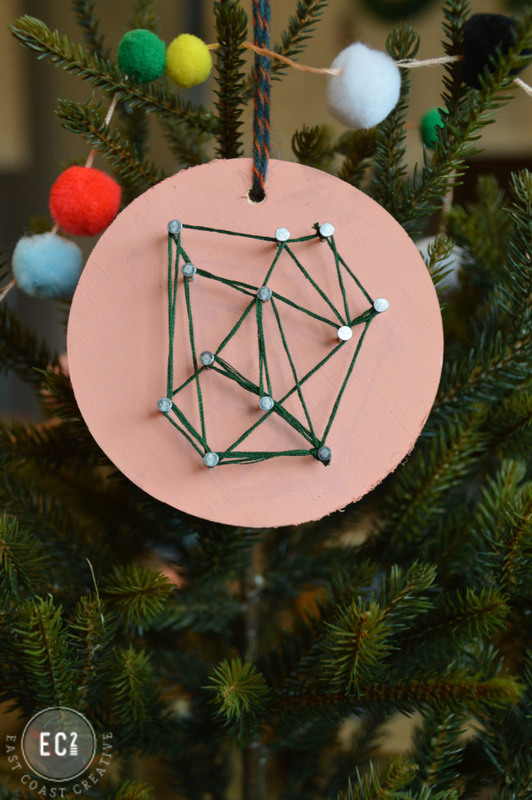 You could easily do snowflakes, snowmen, simple presents- any shape really! I love the look on the tree, but I also leaned some against my planter as mantle decor. 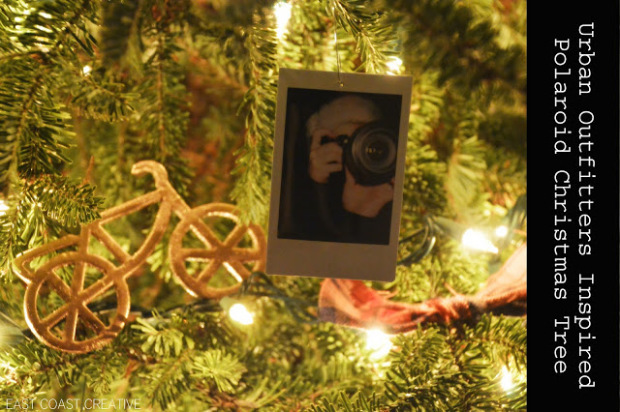 Make sure you come visit East Coast Creative Blog next week, because my whole Christmas House Tour will be up- I think I’m more excited about my Christmas decorations this year, than any year before!! 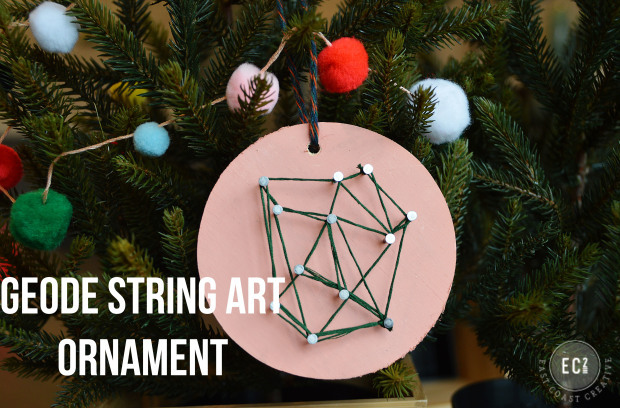 Now, for all you modern-loving folks out there… let’s talk Geode String Ornaments. 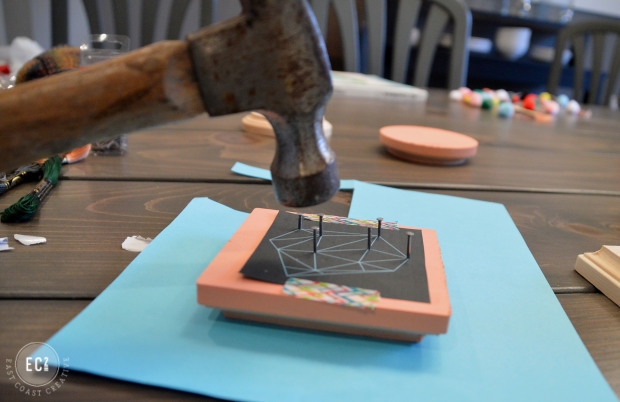 I’m a big fan of these geode shapes and my gal pal Mandi made a fun piece of art, which got me thinking I’d love that idea in a mini ornament sized version. 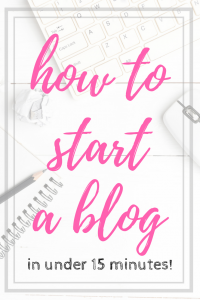 Mandi and I both used Jamie for our blog designs and she created the fun, geode graphic. I spray painted the wood a blush/peach color and then taped on my template. 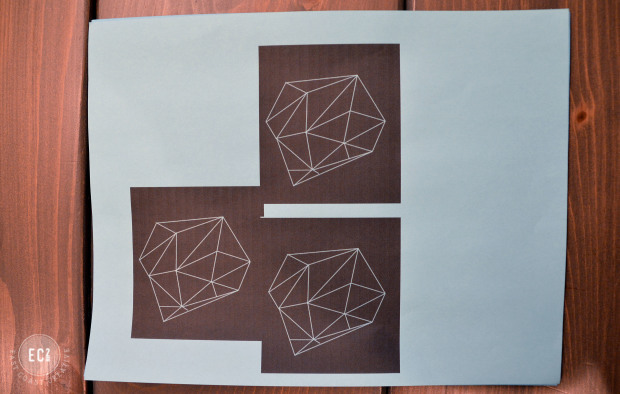 To capture the look of the shape, you’ll put a nail at each line intersection. For this one, I used a multi-colored thin, yarn because I liked the look it had. 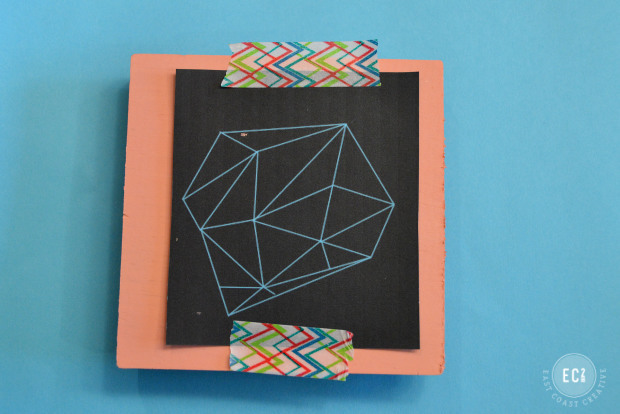 Tie a knot at one of the nails and then follow all the lines to create your shape. The order doesn’t really matter, just make sure you go across each line. There were about 2 I skipped, just because I thought it was overkill, but otherwise I followed the template. 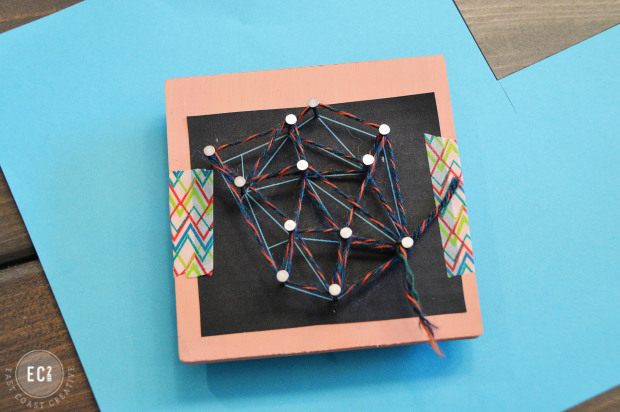 Pull the paper away and you’re left with this beauty! 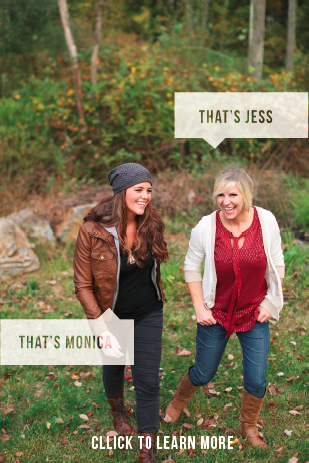 Jess and I both have different design styles, so I love when one of us comes up with a project that appeals to all different peeps! 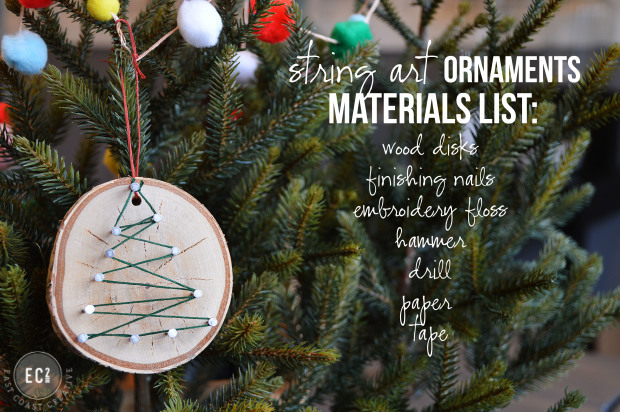 If you’re looking for even more holiday decorating inspiration, here are a few of our favs from the past few years. 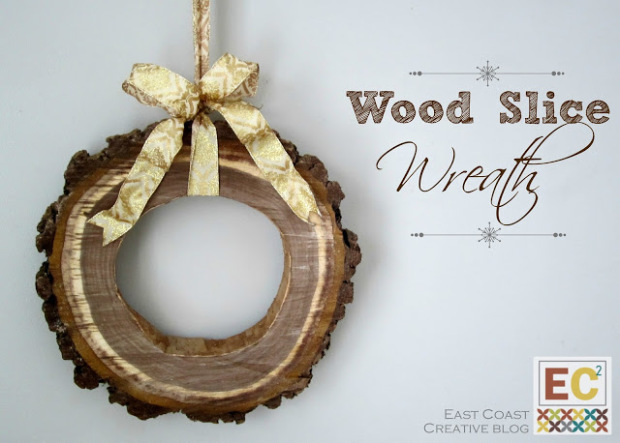 Wood Slice Wreath– I love that this one can be on your door all throughout the winter. 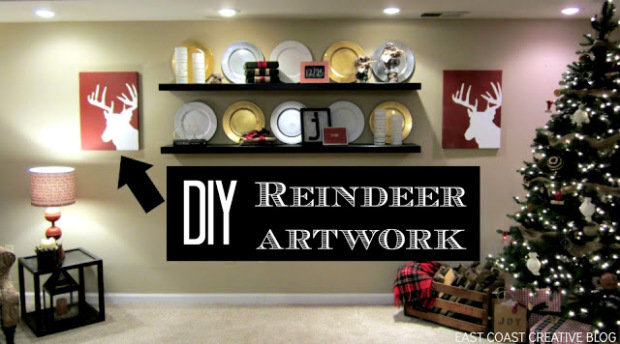 Reindeer Silhouette Art– This one is a fan fav on EC2 and was done for one of our Nate Berkus Show episodes a few years back. 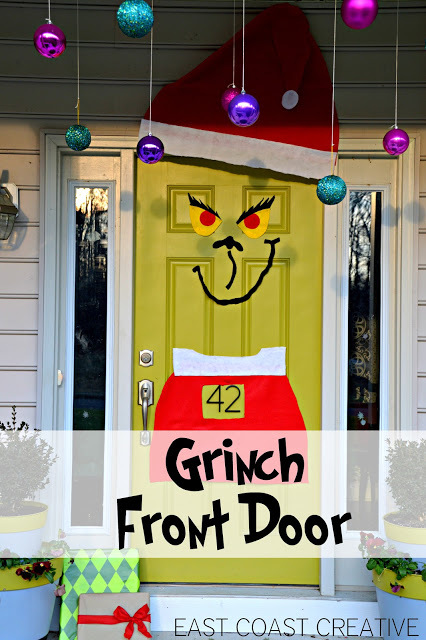 And of course, no one likes a Grinch around Christmas, but my kids loved having him on our front door! And since Instagram is so popular these days (@Eastcoastcreative) my old Polaroid picture tree could easily be done using IG prints! We hope you all have an amazing holiday season and hope you’ll hop over and visit us at East Coast Creative sometime soon! 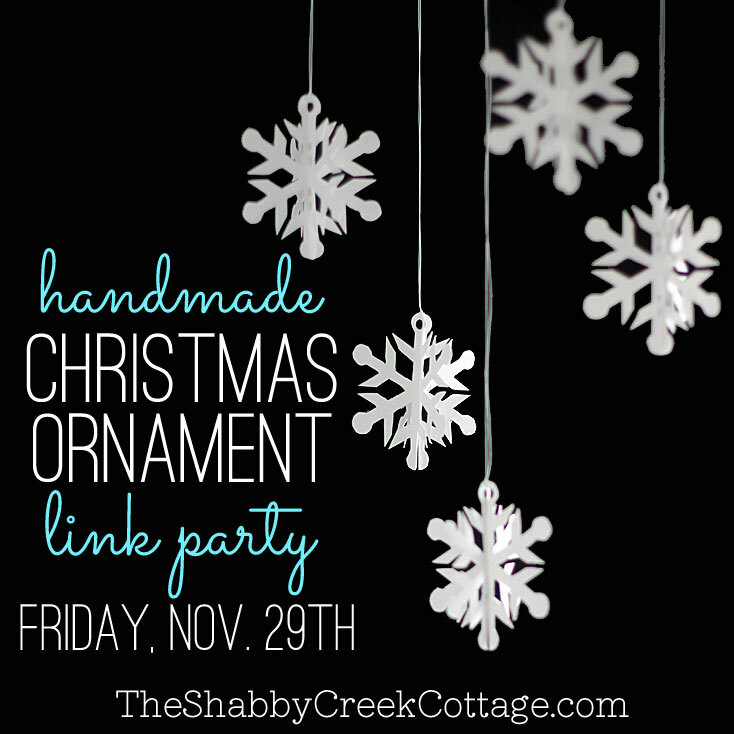 All week this week I’ll be sharing some great handmade ornament ideas from a few of my friends – with a link party on Friday to share YOUR handmade Christmas ornament ideas. 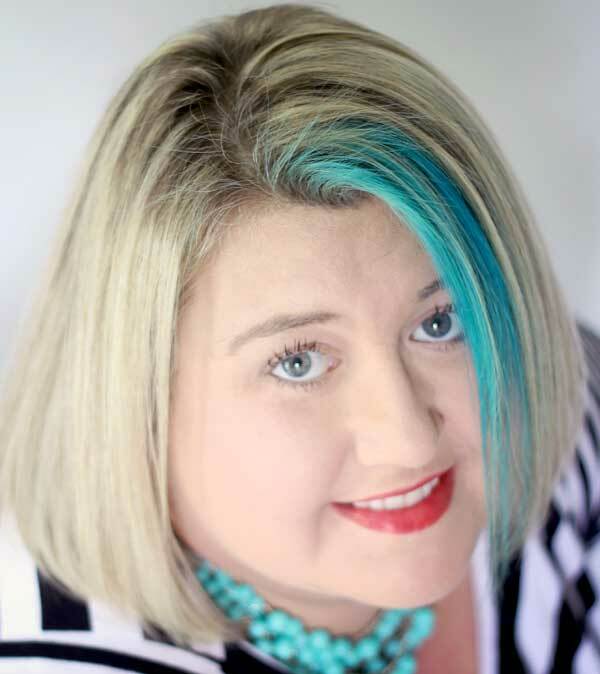 Hope you’ll join me! Okay, these are amazing!!! Loving! 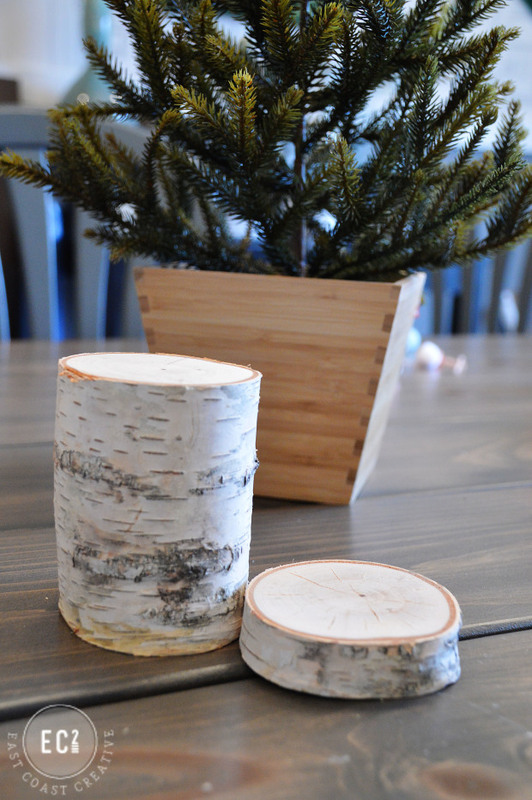 So loving these…i am head over heels over the white birch Christmas Tree…so fabulous and the Geode…AWESOME!!!! 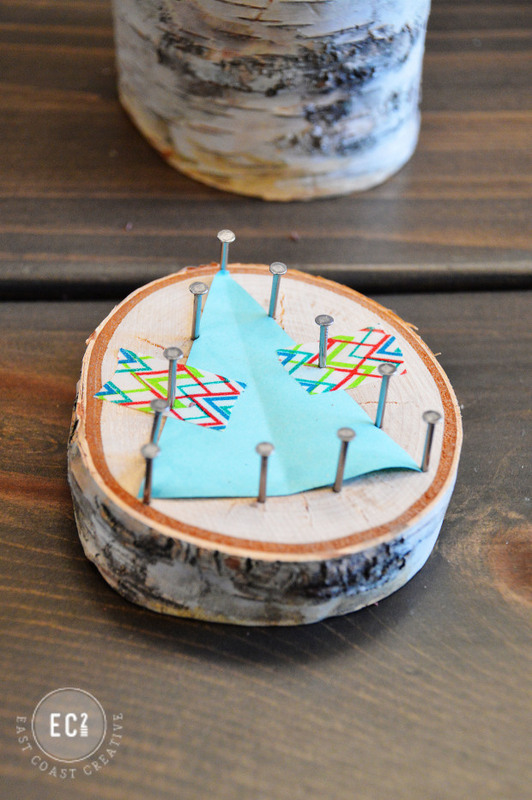 The wood slice wreath rocks…I featured that one myself : ) LOVE it all and thanks for sharing all of this creativity with us…hugs to you both and of course our hostess with the mostess Gina for always bringing us awesomeness!